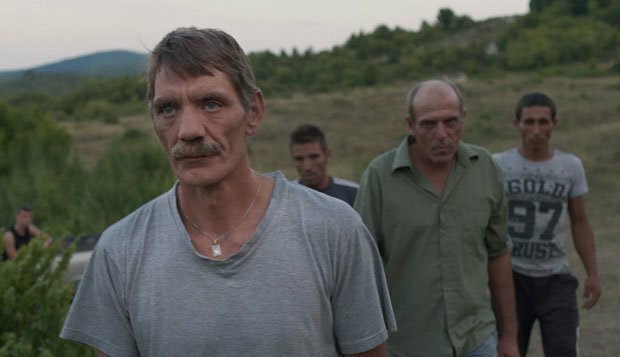 Valeska Grisebach's subtle, slow-burning drama Western packs a lot into its deceptively simple storyline. Reworking familiar genre ingredients, from the mysterious loner to a close-knit rural community, it touches lightly on issues of European identity, toxic masculinity and the way the past never quite surrenders its grip over the present. Meinhard (Meinhard Neumann) is as flinty and laconic as Clint Eastwood's 'Man With No Name'. He is part of a group of German workers who arrive in a small Bulgarian village to construct a water power plant. The locals are far from friendly and some of the workers seem determined to live up to the stereotype of arrogant, boorish incomers. A German flag is raised over their little bit of Bulgaria and local women become objects of their desire. Meinhard is more curious to explore the area. He starts to discover a sense of kinship with some of the villagers that is more potent than any connection he has with his fellow workers. As lean as its leading character, Western beguiles with its sharp intelligence and understated emotions. There is a growing tension between the villagers and the workers that finds its focus in control of the scarce water resources. Language becomes a complicating factor in the struggle to understand each other. The legacy of Nazi occupation in World War II is still keenly felt in the area. Trying to make amends for one misunderstanding, Meinhard is hailed as the first German ever to offer an apology. But no matter how sympathetic Meinhard appears, he remains apart from both sides. 'What are you searching for here?' demands his new Bulgarian friend Adrian (Syuleyman Alilov Letifov). A film of spare beauty and thought-provoking substance, Western also makes the most of a non-professional cast who add considerably to its gritty authenticity. Selected release from Fri 13 Apr.